On July 5, Carla Stroh, riding her husband’s Arabian horse named Spook, participated in the annual Shamrock Endurance Ride that takes place on the Dietz Ranch southwest of Wheatland. This is the location where Tom Horn allegedly shot Willy Nichols. Stroh was accompanied by her good friend, Barb Orr of Mesa, Ariz., who had come along to do the all-important job of “crewing”. This involves being ready to take care of the horse when they come in for a vet check after the first loop. They have to sponge the horse down to cool it off and have water or Gatorade for the rider. They have to be willing to do whatever job the rider wants them to do at the last minute. Barb excels in this! The idea is to get the horse’s heart rate down to the required minimum so the vet can test him to see if he is fit to continue to ride. The vet tests for soundness at the trot, heart rate recovery after the trot out, capillary refill time, muscle tone and gut sounds. If the horse fails any of these, he is pulled from the race. Horses and riders compete in Seneca Stampede Endurance Ride. BEAR VALLEY – Several rough riders kicked it up a notch last weekend for the Seneca Stampede Endurance Ride. They clipped along several trails, mapped out by ride managers Les and Holly Rouska, enjoying the countryside of the Malheur National Forest while competing. The trail crew has been working tirelessly on the trail as the ride approaches. Most recently, Steve Hallmark and his crew tackled the Pucker Point section. Reports back are that the trail is clear and in good shape. We thank our many volunteers who have put in countless hours making our trail safe and passable. "I crossed this creek on July 5th. I was third in line of a group of horse. The entrance into the creek was not unsafe. The water is deepest in the middle, a bit of a hole, but it was only belly deep. I didn't get my feet wet. The exit up the bank is a little difficult but not unsafe, nor any worse than other trail obstacles prior to this point in the ride. The worst part is a boulder in the creek in front of the exit. The rider has to decide to go left or right around the boulder to exit the creek. The three of us went left. Overall, this creek crossing is no more dangerous than other sections of the trail. As far as riders turning around and going back to Last Chance, during the ride this would be very dangerous and no rider should go backwards on the trail until the Sweep Riders have passed." Dawn Tebbs loves a challenge. The 46-year-old Auburn business owner is in for one when she tests the 100-mile Tevis Cup for the first time. Tebbs, who will begin her journey at 5:15 a.m. in at Robie Park near Squaw Valley on Aug. 9 in hopes of reaching home within 24 hours, will be riding Beylis Comet, a 10-year-old bay mare. If I have to reset my own femur, which is what they teach you how to do, I will cross the finish line. HINCKLEY, Ohio -- Say "derby" in the sporting world, and it's "Kentucky" that immediately comes to mind. But the world's most grueling horse derby takes place far from Churchill Downs. It's run in the Mongolian Steppe and as we found out a local woman is among a small group of international riders brave enough to try it. With 2 weeks till the 59th Tevis Cup, 193 riders from 12 countries have pre-entered the ride. Foreign riders are from France, Ecuador, Australia, UK, Austria, Germany, Japan, Norway, Canada, Israel, and The Netherlands. The field includes 8 juniors who have taken advantage of the Juniors Ride Free promotion, sponsored by EasyCare. Hannah Pruss and Krusador won the legendary Big Horn 100 in Shell, Wyoming on July 12th, in 14:05, finishing in the daylight. Just 7 minutes behind her were husband-wife team of Dennis and Sue Summers, riding AH Bantiki (aka "Bogart") and Oh Susanna (aka "Peach"), respectively. Bogart won the Best Condition award. It's a tough ride, "around 15,000 feet of climb and descent through some of the most scenic, and rocky country I have ever seen," Dennis Summers said. "At any pace this trail presents huge challenges… Anybody who reaches the finish line knows they are a serious endurance rider aboard a serious endurance horse." Sami and Linda Browneller and Christina Long finished 1-2-3 in 7:30 on the 50-mile ride, with Best Condition going to Long. Riders praised the volunteers, ride management and organization, and trail markings for the successful ride. "Spectacular company, horsemen, trails, ride management," said 10th place finisher and 3-time buckle winner Roxi Welling. Talk about a long distance rider! In 1872, Isabella Bird, daughter of a clergyman, set off alone to the Antipodes 'in search of health' and found she had embarked on a life of adventurous travel. In 1873, wearing Hawaiian riding dress, she rode her horse through the American Wild West, a terrain only newly opened to pioneer settlement. The letters that make up this volume were first published in 1879. They tell of magnificent, unspoiled landscapes and abundant wildlife, of encounters with rattlesnakes, wolves, pumas and grizzly bears, and her reactions to the volatile passions of the miners and pioneer settlers. A classic account of a truly astounding journey. Nominate a worthy AERC member for: Hall of Fame Member, Hall of Fame Equine, Pard'ners Award, Volunteer Service Award, and Ann Parr Trails Preservation Award, this year's highest honors. Nominations are due August 1, 2014 -- send to Vice President Lisa Schneider (see form for details). Honors lifetime achievements by recognizing outstanding performances or outstanding contributions to the sport or to AERC. Rider and horse perform together as a mutually bonded team. Rider and horse engender a spirit of friendship, enthusiasm and championship that makes those around them glad to have attended the ride. However competitive they may be, good sportsmanship remains their first priority. Horse and rider take care of each other. Together horse and rider personify the prevailing and abiding goal of AERC "To Finish is to Win." This award was established in honor of the late Mae Schlegel. This award is established to honor an AERC member who has devoted an extraordinary amount of volunteer effort, time and service on behalf of the AERC for many years. This award may not be given every year. The world's prettiest equestrian athletes will be parading through Henry Cowell Redwoods State Park, Upper UC Santa Cruz and Wilder Ranch State Park this Saturday. 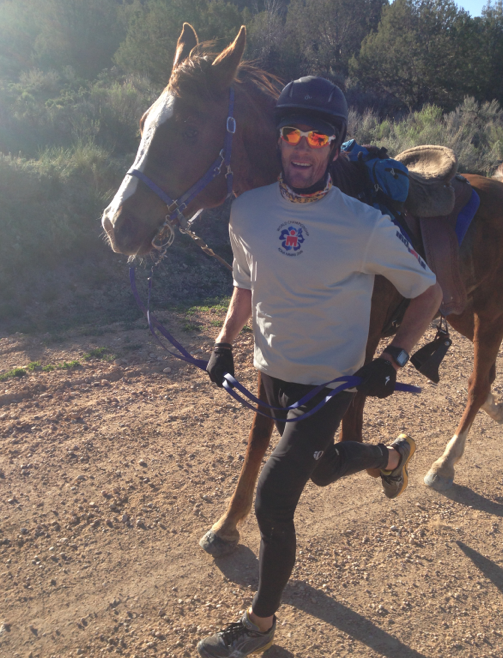 Tune in to http://www.horsesinthemorning.com/ tomorrow for Endurance day. Karen Chaton's guests are 17-year-old junior Jordan Rae who is entered in Tevis this year on a Rocky Mountain horse that she trained and conditioned herself, and Jeremy Reynolds, who will talk about what he thinks about the differences between running the WST 100 and riding it (he's won the Tevis Cup 3 times) and then will also talk about the USA team selection process for WEG coming up in August. To listen live, go to http://www.horsesinthemorning.com/ and add the phone app to your smart phone if you have one, otherwise you can listen through a web browser on Tuesday - 6 to 7:30 a.m. PST (9 to 10:30 EST). With just under 5 weeks till the 59th annual Tevis Cup, you can still enter the ride for the normal ride entry fee. Traditional ride entry is $400, which includes drug testing, Robie Park camping, one ticket to the Friday Night Dinner, and one ticket to the Sunday Awards Banquet. First time finishers may choose to receive a Legacy Buckle for no charge. Award buckle is $150.00 when reserved pre-ride and is nonrefundable. Buckles are $199 when purchased post ride. helicopter insurance for the weekend and parking assistance at the Robie Park ride camp and Foresthill vet check. Signature Entries are limited to 15 riders. The ride entry fees increase by $100 on July 13. Ten years ago I made a conscious decision to live my life outside of my comfort zone. I had held in my grasp for a fleeting few seconds the feeling that I could do the things I thought were impossible, and it was intoxicating. It was the start of a lifelong adventure which has taken me to the jungles of Papua New Guinea, the sand dunes of the Moroccan Sahara, the remote outback of Australia, up and over the unforgiving hills of the Comrades marathon in South Africa, over staggering altitudes in the Rockies, swimming 6 miles in the ocean off Hawaii and now riding five back to back 50 mile days on horse back in Utah. Over the years as I pushed and explored the boundaries of my comfort zone, or discomfort zone as I came to know it, I developed a philosophy I called More Than The Finish Line, which effectively focused on my journey, allowing me to live outside of my comfort zone but in a way that made sense of the set backs and managed my expectations. It allowed me to let go of finish lines and showed me the value and the joy of the journey. When I look back 15 years I could never have imagined that I would be where I am now, a South Africa born, naturalized Australia, living in the Coloradan Rockies on a property, with horses and dogs, and plenty of local wildlife, riding the trails on horseback and working for a not for profit that encourages kids to get off the couch and outside. On our wedding day in October 1999, I weighed a hefty 253 lbs, all of which I attributed to my Rugby Union playing background, and the requirement to stop a charging athlete dead in his tracks. Over the past 15 years I have spent all of my energy and focus on trying to become as efficient as possible over long distance. Being a bigger framed athlete (6.3ft) I have always found that longer, harder and tougher has tended to suit me, by bringing everyone back to a level playing field. Over the years I have competed at the highest level in Ironman Triathlon, run a multi-day race across the Moroccan Sahara desert and run competitively at the half-marathon, marathon, 50 mile and 100 mile distances. In 2010 I was fortunate enough to cross the finish line first at the Ultraman World Championships in Hawaii, a 3-day endurance triathlon, and decided that I had spent a long career in triathlon, and that it was time to pursue something different. At the time I was working for a global engineering firm in Australia, while studying to be a coach and personal trainer. To walk the talk I needed to follow my passions in life and get out from behind a desk. The author challenges many current notions about breeding and showing. He also questions whether Western breeders should continue to set the parameters for “Egyptian” breeding or whether breeders in Egypt will reclaim their history and take responsibility for safeguarding the Egyptian Arabian horse for the future. A book to challenge the thinking of all Arabian horse breeders. As the source and foundation of Egyptian Arabian breeding, it is important for breeders to learn as much as possible about the E.A.O. and breeding in Egypt. El Zahraa is at the core of many of the key issues. The Egyptian Alternative presents a well thought out approach to preserving all the bloodlines and to utilizing them in a careful way that will insure they remain an integral part of our cultural heritage. --Ahmed S. Hamza, Former Chairman, E.A.O.